This past year, my sister-in-law, Jodi Antinori was named Teacher of the Year. She traveled with fellow teachers to Denmark with the Center for International Understanding (http://ciu.northcarolina.edu/). The trip was funded by the James G. K. McClure Foundation. 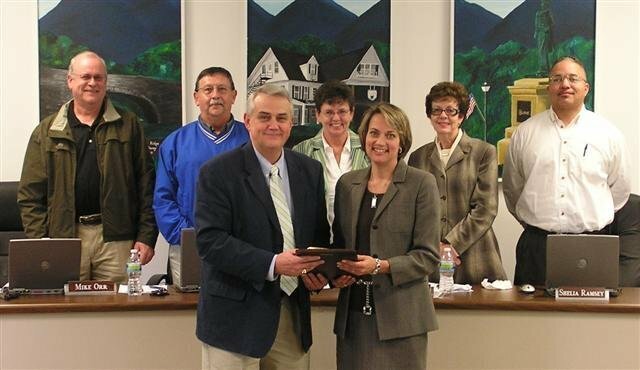 Jodi Antinori has been honored as the Yancey County Teacher of the Year. She is a fourth grade teacher at Burnsville Elementary, North Carolina and an executive officer in the schools PTO. Jodi is teaching her students to be physically active through the Fun Fit Fridays program, which instructs kids about eating healthy and staying involved in physical activities at the school. She has been at Burnsville Elementary since 2004 and recently presented several workshops on various math topics to fellow 4th grade teachers after completing an extensive professional development study in the Math Partners program through Meredith College. She has an extensive background in elementary education and is a huge asset to the Yancey County School System. Jodi grew up in North Dakota and moved to Burnsville, NC in 2003 with her husband Joe, and three boys, Luke, Vincent and Theo. She has been working at Burnsville Elementary since 2004. Before coming to Burnsville she taught for five years in New Jersey and for two years in Papua New Guinea as a Peace Corps Volunteer. (She met her husband Joe in the Peace Corps. Joe is a family doctor in Burnsville.) She graduated from the University of North Dakota in 1991 with a BSEd in Secondary Social Science Education. In 2003 She received her MSEd in Early Adolescent Education from Bank Street College in New York. In 2010 Jodi earned her National Board Certification. 3 Responses to did you know…? Good job Jodi and you know TJ MIddle School has been missing you ever since! Wow! So impressive, and well deserved. I have the distinction of hanging with Tacher of the Year Jodi all week at the Girt! So glad to know that Jodi has been recognized for her contribution to the educational system in Burnsville.